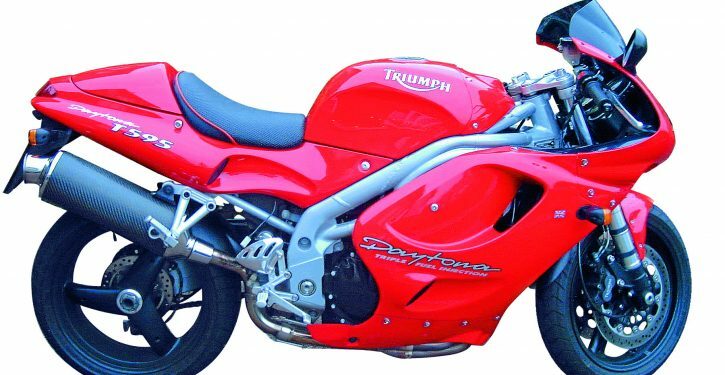 Home » Bike Reviews, News & More » Triumph T595 Daytona – Tomorrow’s Classic Today! 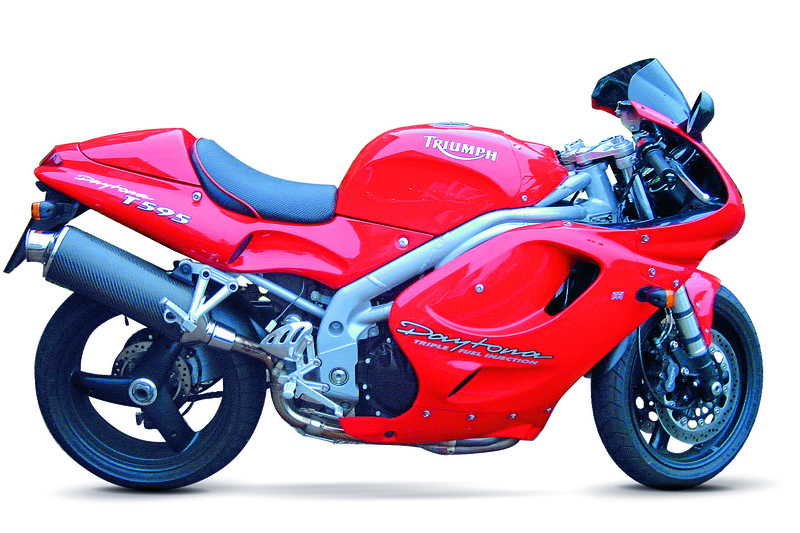 Triumph T595 Daytona – Tomorrow’s Classic Today! CB-Net wants to do some jingoistic flag-waving right now and celebrate the mighty bike that was (and is) the Triumph T595 Daytona. It’s amazing to think this machine is now nearly 22 years old so let’s re-examine the affect and impact it had on the motorcycle market. Motor and chassis were – at first – unique to this model. The frame rails are swoopy aluminium that were subject of a frame recall early on just after launch, when some allegedly snapped near the headstock. Triumph did a good job of keeping new owners informed and changed the frames under warranty, giving them an accompanying letter to prove it. The swingarm held an attractive, exposed three-spoke wheel while the motor was a three-cylinder Sagem fuel-injected 955cc lump. Ahhh you see it: T595 which is a 955? Well, T595 was the code-name – following on from the earlier T300 series. The T595 Daytona was later called the 955i Daytona from 1999, so as not to confuse people just prior to the launch of the 599cc TT600 middleweight sports bike. Jab that starter button and the engine sound is a tad clattery, but unmistakably a triple: rich and different to the dull inline fours of the time. It’s that sound you’ll get addicted to, as well as the rich seam of grunt-into-power that only three cylinders can provide. The ‘market leading’ newspaper of the time trumpeted (see what we did there) that the T595 was a FireBlade beater. Typical hyperbole from the weakly news: see what we did there? It was never really a match for a CBR900RR – let alone 1998’s Yamaha YZF-R1 – but it did its own thing in its own way: and this makes it a winner in our eyes. Over the years, as well as the name change it went through a number of refinements and aesthetic evolutions, going up in power from 120-130bhp until the last models trundled out of the Hinckley factory in 2006. As it was new back in the day and different – as well as being Triumph’s first stab at a big-bore sporty bike, this machine did have issues. Firstly, the fuel-injection/engine management light would often just come on when it felt like it. Clutches were heavy, gearboxes were notoriously notchy as standard (some wrecked 4th gears were changed under warranty) but the 1998-on direct-to-the-gearbox-lever connection improved the overall feel big time. The delicate hub chain adjuster can seize if not kept clean, Triumph’s own hi-level carbon end cans can be leaky and while oil leaks were rare, some electrical issues (aside from that pesky engine light) were reported by owners. Changes over the years came thick and fast… Uprated camshafts came in for 1998, 1999’s 955i had some suspension changes, before a major aesthetic revamp came along in 2001, along with a revised cylinder head and 130bhp. The 955i also received further bodywork changes in 2005 before it left Triumph’s model range. Finding a good T595/955i is pretty easy as many owners were a little more ‘mature’ shall we say than Blade or GSX-R owner of the time. That means additions were often tasteful and ‘official Triumph’. Many were well looked after. On the first models, you’ll need to make sure the history is good – along with that factory frame swop. Colours are the rich yellow/gold and a super-cool black. It’s logic when we tell you the later bikes were much better – and in some regards now rarer, as they weren’t massive sellers. Even today a 2006 955i is a great road bike. Price-wise things are firming up a bit… around four or so years back you could get a shitter original T595 for a grand or less. Rare as rough ones can be… Now a good starting point is around £2000 for that early model. While some early model low-milers are being advertised for as much as £5000, you can still get good examples of all models (even the best 2000-2006 variants) for around £3000 or less. That’s value! So wave the flags and sing God Save the Queen for Britain’s Brexit biking bargain… Vote Leavers wouldn’t ride anything else! FOR: Still quite cheap, but not for long. AGAINST: Had some issues, but pretty sound. Major changes Warranty frame swop after launch, colours, cams and gearbox (1998) motor/looks 2001 and 2005.